It was all a bit of a mad rush getting myself sorted for the opening round of the National CX Series. Luckily super mechanic Ben (with some help from D-man) from St Kilda Cycles had my back up bike dialed to perfection! I have also been lucky enough to have my own custom skinsuit with sponsor logos on it made for me by Champ-Sys custom clothing. Look at any custom clothing out on the road or trail and chances are it's made by these guys, they make some awesome kit, so to be on board with them is very flattering. It came up an absolute treat too! 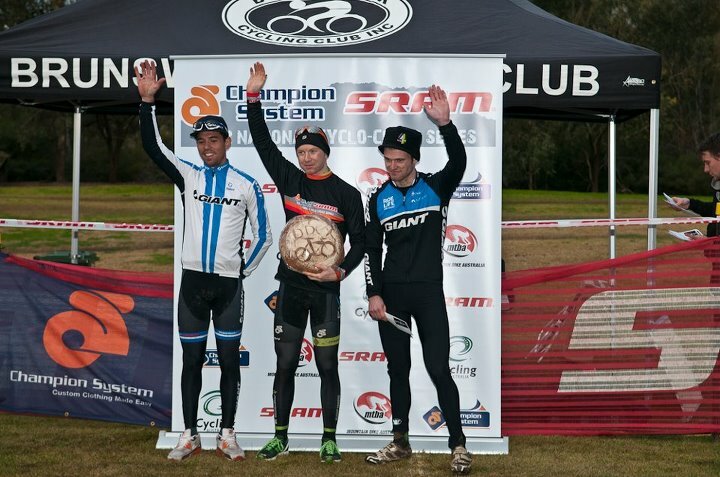 The National Series is sponsored by two of my own sponsors, which is fantastic, in Champion System and SRAM, and it will be getting some coverage by SBS program Cycling Central! I ended up doing an interview for them, and surprised myself by how well I answered the questions. Just my luck, the loudspeaker was on at the same time and I had to re-do it on Sunday, where I made a complete mess of it. Hopefully they can use something! The first race was in Port Melbourne, held by Full Gas, on a Go-Kart track. Very cool set up, with tarmac, grass, mud, puddles and a few gravelly sandy sections. It was tough! We also had a full hours racing. 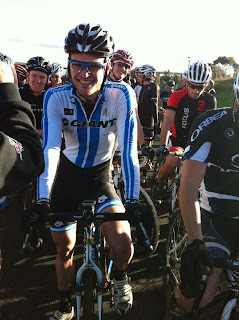 With 70 odd starters in A grade, I was very lucky to be called up first. The start list included about 10 of Australia's best XC mountain bikers, a couple of NRS level roadies, and a couple of stoempers from a few years ago. I was asked to pick who I thought would win prior to the start - it could quite literally be any one of 20 odd people. I got a decent start and slipped into 4th or 5th, before moving up into the top 3. Myself, Adrian Jackson and Paul Redenbach and Mitch Codner got a gap on the field, and were working together well and we were soon joined by Luke Fetch, who had stormed through everyone from a poor grid position. The gravel sections started taking their toll, as a wrong line choice would mean you work excessively hard and go painfully slow, and dismounting to run would result in gravel stuck around your cleat and not being able to clip back in! About 30 mins in, I began cramping, and my race got a whole lot worse. I dropped off the back of the group into no mans land. 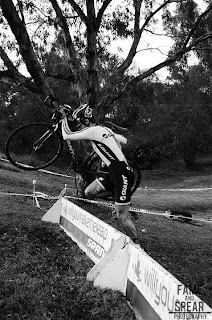 Fighting the cramps and trying to hold my position took its toll and I starting losing concentration, eventually going over the bars in the gravel! I was reeled in by Marc Williams and Andy Blair, with Alan Iacuone closing in on me, Mitch was unlucky, breaking his derailleur and having to run the last lap! The race seemed to go on forever, and I seized up over the finish line, unable to stand up properly! Considering the field, I couldnt be dissapointed with 6th, but given my experience I was expecting a little more! And I was pissed off about the cramps. I've tried everything! Magnesium, Potassium, Quinine, Sprays, Tablets, sports drinks, plenty of water, and still I get cramps! Any ideas anyone? First timer Luke Fetch ended up taking the win, from Adrian Jackson and Paul Redenbach. Luke's hardly a newbie to racing though, he's raced MTB Worlds and is consistently in the mix at National Road Series. I pulled up very stiff and sore on Sunday morning, thinking I would have a rubbish day on the bike. Luckily the bike was running as good as its ever been, as I am exceptionally lucky to have a mate in Ben, who works at St Kilda Cycles and occaisionally for his own business, Velo Lab. Ben grabbed my bike on Saturday and prepped it for Sunday! Superstar! The Dirty Deeds crew always put on a good show and Sunday was prime time. 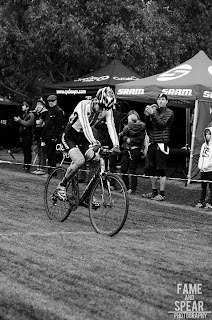 I have a soft spot for Darebin as it's where I had a big win last year, and was also my first race on a CX bike the year before. 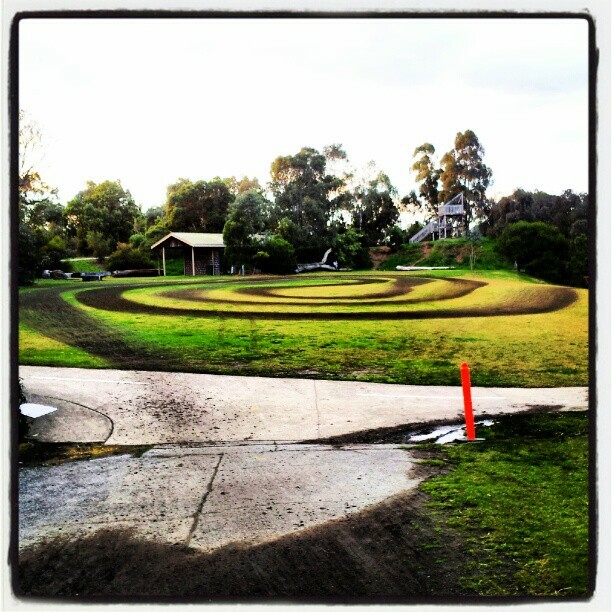 Mud, grass, ups, downs, bike paths, it's got it all. From the gun I was in about 8th or so, and dug deep to get out the front with AJ. 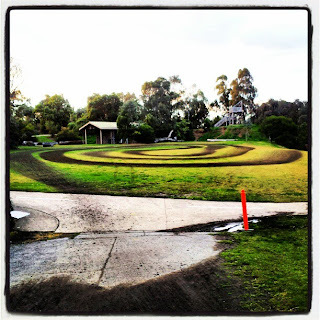 I like Darebin because a bit of a break goes a long way, you cant see round all the corners. For the first 30mins or so we were riding well, before that familiar pinch arrived and I started cramping again! AJ started pulling away, and I wasn't able to keep with him, I had to stretch out my cramps and try to keep hold of second place. 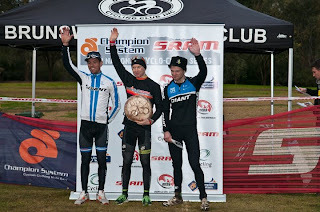 Lachie Norris had a much better day and ended up reeling me in with a lap to go. 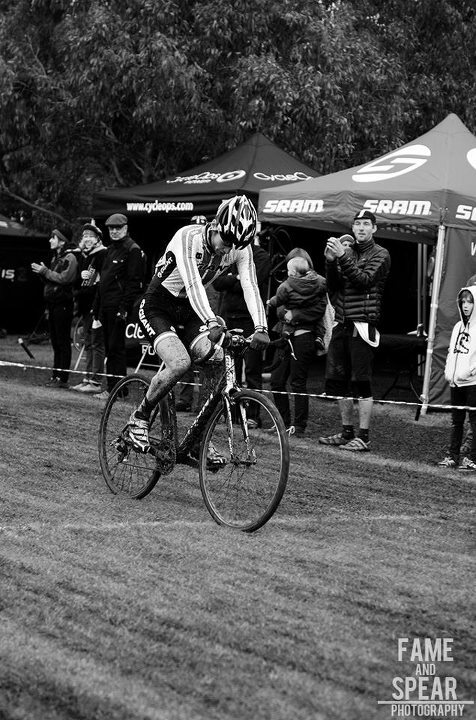 Malachi snapped a pic of the moment he caught me, and it pretty much sums cyclocross up. 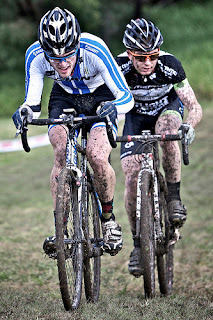 Cramping, getting caught by 3rd place, and we both look like pigs in sh*t. Heaps of fun. The crowd got right into it, especially around the mud puddle, and it was great having plenty of support from friends and family. A much better result for me and hopefully I can improve on it at the next double round in Adelaide in a few weeks! I also have to thank a few other individuals for their help over the weekend. Rob (SRAM), who had all sorts of spares ready, with mechanics, and had my pit bike ready in the case of a mishap. Aaron (Giant Australia), who brought the Giant tent and chairs down, providing a perfect place to warm up on the trainer and get ready. Aaron brought down Jake, who was exceptionally helpful before the start, and made sure I kept warm! 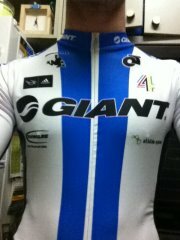 Of course I would also like to thank my fantastic sponsors: Giant, Sram, Adidas Eyewear, Champ-Sys, Schwalbe, 4Shaw, Creux.